1. Add the black bean penne pasta to a large pan of boiling water. Reduce to a simmer. Stir occasionally. Cook for 4 to 5 minutes maximum. Drain well and run under cold water for a few seconds to stop cooking. Toss in a little olive oil to taste. Set aside. 2. Slice the tofu into cubes and add to a wok. Add in the garlic clove, red chilli and sesame seeds and sauté. Add in the shredded carrot, green beans, red cabbage and soy sauce. Sauté at a medium temperature for 5 to 10 minutes and then lower the heat. 3. 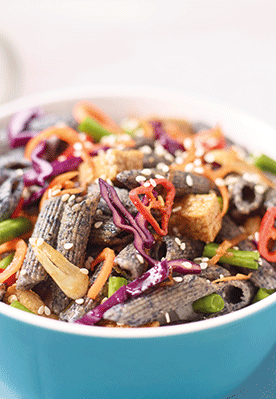 Mix the tofu and vegetable medley into the black bean penne pasta and serve.